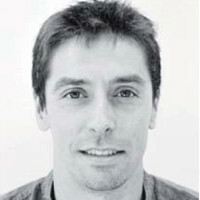 Pablo Gutiérrez was born in Huelva in 1978. In 2011 he won the Ojo Crítico Prize for Nada es crucial. His first novel, Rosas, restos de alas won the Tormenta en un Vaso Prize for best new author in Spanish. He was selected by Granta magazine as one of the best twenty-two young Spanish language fiction writers. In 2001 he was a finalist in the Romero Esteo playwriting competition with his play Carne de Cerdo. In 2011 he was a finalist in the Ribera del Duero short story prize with Ensimismada correspondencia. He is a literature teacher at a school.